Chicago Chapter 2015 Event – Open Mind / Open Body: connecting the voice community through science + sound! A Local Chapter is a group of TVF members who live or work in a particular locality and who, as a matter of geographic convenience, organize themselves to promote the goals of the Foundation cooperatively. It serves as a focal point for its members to share their professional experiences and provide educational opportunities for themselves and their communities. Local TVF Chapters offer a number of benefits to its members. 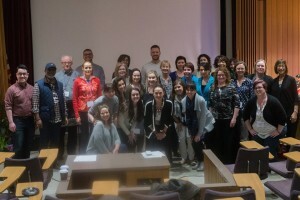 The goal of Local TVF Chapters is to offer people interested in the different disciplines of voice care and training the opportunity to come together regularly to share their experiences and to encourage each other in activities that conform to the Foundation’s goals and policies The focus is on truly local activities connecting professionals with each other. Events and meetings with invited speakers, workshops, master classes and mini-symposia are some examples of what a Local Chapter may offer. Above all, it provides a handy and convenient network for everyday access. The purpose of this is to introduce the concept of Local Chapters and to encourage you to create one in your hometown. One of the greatest resources for professional and personal development is to meet with colleagues from various disciplines in the fields of voice care and training (ENT, SLP, Voice Pedagogy, Voice Coaching, and others). You gain new information on state-of-the-art technology, access to others’ perspectives, experiences, and knowledge; and you will get the chance to broaden your insights. Your Chapter meetings and activities allow you to expand your knowledge of voice research/development. Chapters bring continuing education opportunities closer to home and provide a bridge between the annual TVF conferences. It is also possible to organize Mentor Programs as a way for members to grow in their professions. The Local Chapters will give you the possibility to exchange both professional experiences and services, such as reviewing each other’s papers and conference contributions. It will also act as a greenhouse for new ideas that can be implemented globally and provide TVF with potential new members of the Advisory Board. The Detroit Chapter Email us for more information. How to form a Local Chapter. If you would like more information on starting a local chapter of The Voice Foundation please contact Maria Russo, Executive Director, at (215)735-7999 or Email us.